I’m a little late to the tidying-up craze since I’ve been preoccupied with launching my small business. I participated in our first big event this past weekend and have devoted this past week to regaining order in my shambles of a home. I’ve been mainly focusing on closets, reducing clutter, and reorganizing the essentials. It can easily become overwhelming when dealing with so many things but is so satisfying at the end of the day. 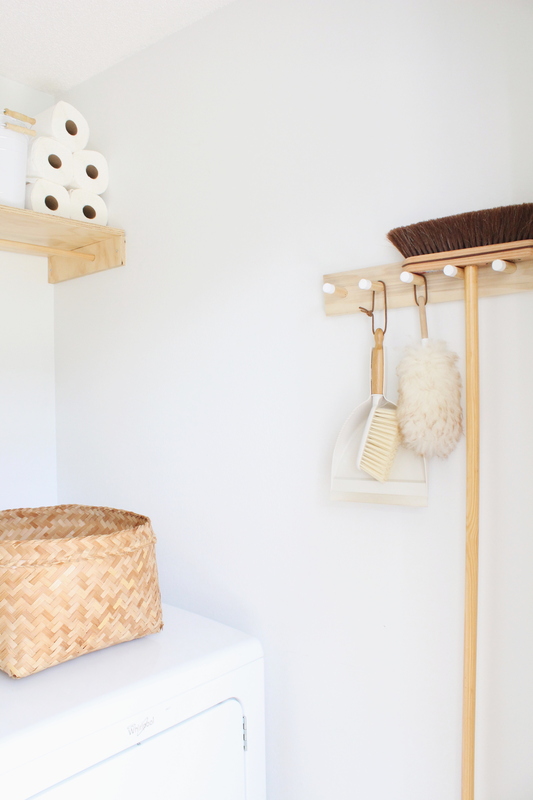 In the spirit of cleaning, it’s a good time to show you our laundry room. This isn’t the place we store all of our cleaning supplies, but it’s where some important ones live. I’ve learned I’m more likely to clean if the necessary tools are easy to access throughout the house. 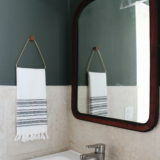 It also helps to invest in good quality, pretty cleaning supplies, that aren’t an eyesore to leave in plain sight. 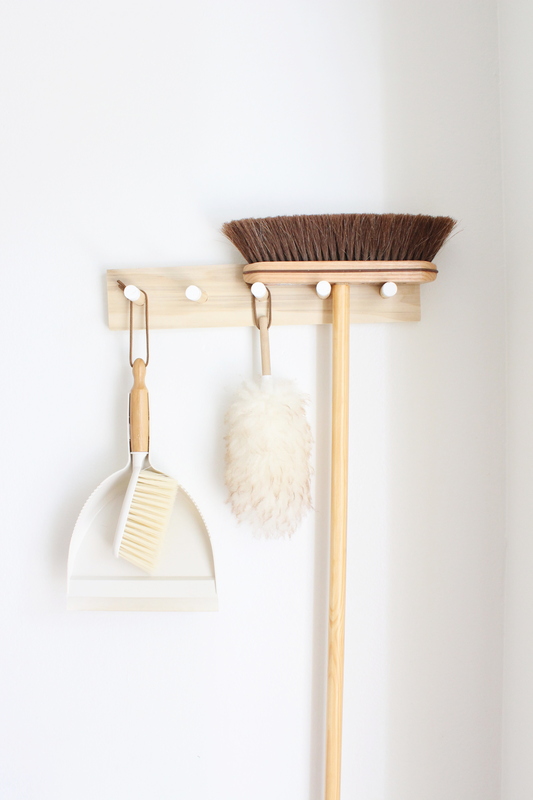 The peg hanger is a mini version of my entry way peg hanger (without the shelf) and the horsehair broom, handheld dust pan set, and wool duster can all be found on Amazon. Before baby Dennis arrived, I painted the room white and installed the shelving. 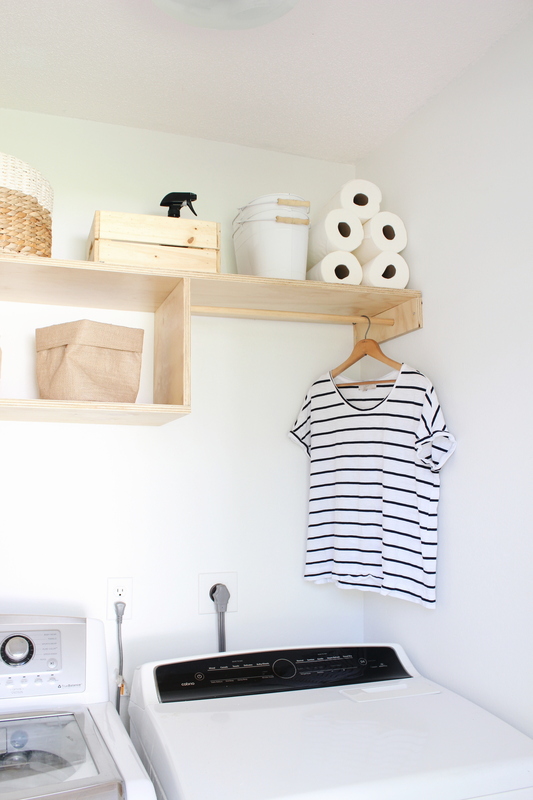 I built it using 3/4 sanded plywood and used a double sided screw (just like the one in the towel holder tutorial) to attach the dowel rod into the wall, creating the perfect space for hang drying delicate shirts. 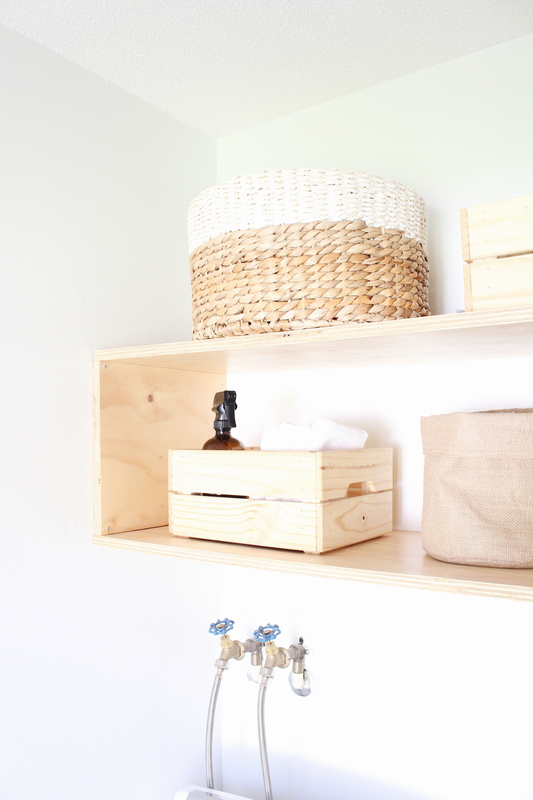 The wooden crates from Ikea store our laundry detergent, stain removers, and bathroom cleaners. The small hemp basket is perfect for holding dryer lint. Before this room was yellow and had one wire shelf with no storage. It serves our large family much better now. It always amazes me how proper storage transforms the way a room looks and functions.